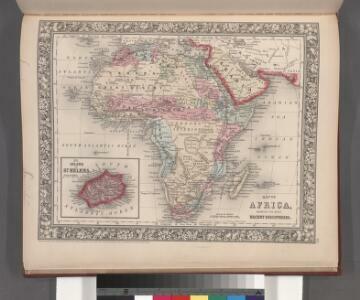 Map of Africa, showing its most recent discoveries ; Island of St. Helena [inset]. Karte vom Grossen Ocean, (Mare Pacifico). 1 : 57000000 Goodrich, S.G.
Karte von dem Vulkan Gurtel. Oceania, or Islands in the Pacific Ocean. 1 : 41000000 Fullarton, A. & Co. Die Vulkanischen Erscheinungen Der Atlen Welt. 1 : 50000000 Letts, Son & Co.
[Pocket] Map of the Borough of Queens, New York City. A new map of Africk shewing its present general divisions, chief cities or towns, rivers, mountains &c.
Chart of the Great Pacific Ocean. Africa according to the best authorities.